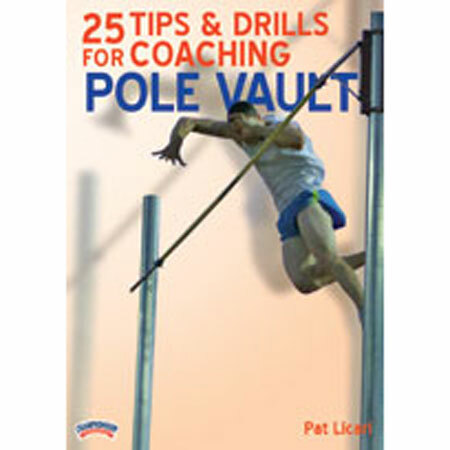 In this comprehensive Tips & Drills DVD, Pat Licari presents 25 teaching tools for coaching the pole vault. Coach Licari believes that a successful vault begins with proper pole carry and approach. The standing tip drop and the marching pole carry are excellent fundamental drills that are taught and demonstrated. The initial steps are developed with the mini hurdle pole run drill. Sled pulling conditions the athlete and works on the driving and pushing action. Licari next details the proper pole carry position by showing hand and shoulder position. He then shares the three-step plant and breaks down each step culminating in the pole at its highest position above the head. Planting the pole is taught through the marching plant drill followed by the three-step approach drill to execute a proper pole plant. 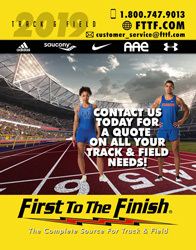 Long jumping is part of the short pole drill with an emphasis on the leg action and the take off mechanics. Licari's "over the tip" exercise, assists the vaulter to accurately determine the position of the hands on the pole. Power comes from the chest drive and Licari shares several drills to increase strength when the pole is planted. The stall technique is used in drill work to emphasize high hands and chest drive. Using rings, the athlete works on the rock back motion and quarter turn. He finishes with horizontal vaults and the short run vault drills.